Hands-on analysis of the world's thinnest minute repeater, with live high resolution photographs, comparisons, specifications and price. Superb sound. Clean, loud, clear. Beautiful harmonics. Very comfortable on the wrist. A combination of the ultra thin case, and the ultra light case. Reasonable price. For a repeater. Aesthetics may seem to some as unexciting. Though to others, the understated looks is a big plus. Bulgari has been blazing the technical haute horlogerie stakes for a while. Their Ultra Thin Octo Tourbillon rocked the foundations of the craft with the world’s thinnest tourbillon at only 1,95mm thick. And this Baselworld 2016, they introduced the Octo Répétition Minute, the world’s thinnest minute repeater. We investigate these claims, and also listen to the watch. This is our review and analysis. The minute repeater game is not new to Bulgari. Through its acquired assets in Daniel Roth and Gerald Genta, now integrated into the Bulgari manufacture, it has a wealth of savoir faire on art of the striking watch. The bulgari Octo Répétition Minute on the wrist. Slim and light. Seems the way to go! And slenderness is not new to Bulgari either. The Octo collection continues to explore this concept. As mentioned, in 2014, the Octo Tourbillon was the world’s thinest. We were quite thrilled with that watch. You can read our thoughts on the Bulgari Octo Tourbillon here. The subject of this review, the Octo Finissimo Répétition Minute (or Octo Finissimo Minute Repeater) pushes the envelope for slimness in a minute repeater. Being slim connotes the very desirable trait of elegance. But being slim is not easy. Not for humans (well, most humans). Not for watches. For watches, it presents specific constraints. The designers have to ensure that the selection of materials and design of the structural elements in the case and movement are not compromised in daily use and do not flex under stress. A watch always need to be reliable and consistent in performance. Day after day, year after year. 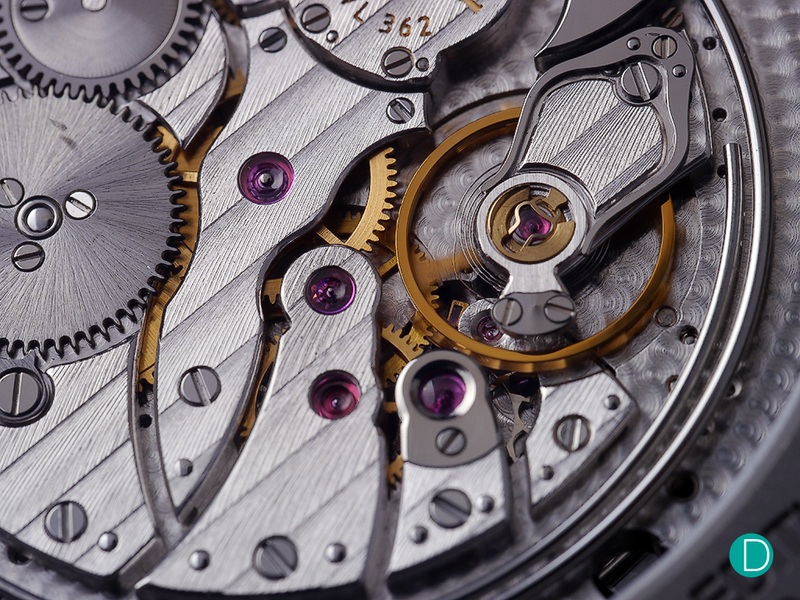 The minute repeater presents additional and specific constraints on the design of the movement as well as the case. It is one of the high complications, demanding extremely high skills of the watchmaker. On the one hand, the sound needs to be intense, crystal clear, with beautiful harmonics and a pleasing decay. It needs to perform (indeed it is a performance) its strikes in a uniform and regular cadence. This is a huge challenge for any maison to undertake the design of a minute repeater from ground up. And to intentionally add the constraint of having to work within an ultra thin space increases the level of complexity. Ultra thin is the name of the game. The case height is a mere 6.85mm. The result in the Octo Finnisimo Répétition Minute is spectacular, and the tale of the tape tells the story. 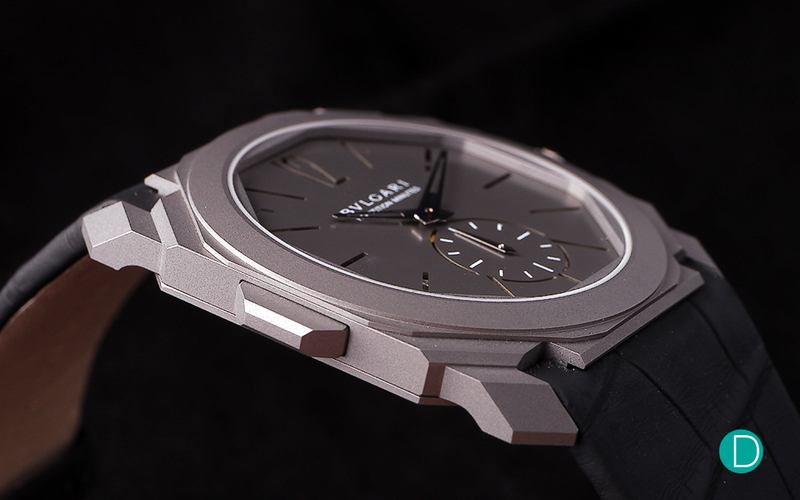 The BLV Caliber 362 within measures only 3.12mm thick, and the overall case thickness is only 6.85mm. The case is the now classical Bulgari Octa case. Eight sided, each side almost equal in length. The case itself has a layered look of a round bezel in a octagonal case, with an added design element of a octagonal ring inside the bezel at the edge of the dial. The lugs are straight, but have steps to create a sculptured look and chamfered edges. Bulgari Octo Finissimo Répétition Minute. Titanium case, pierced titanium dial. Limited edition 50 pieces. Instead of a slide as is customary in a minute repeater, the striking mechanism is charged and activated by a pusher at 9 o’clock. 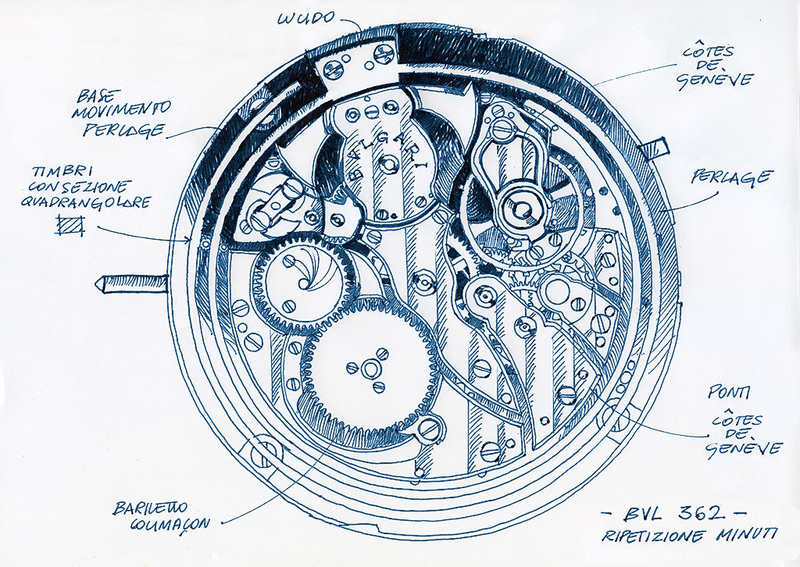 The case side of the Octa Finnisimo Minute Repeater, showing the striking works charging and activating pusher. It is, of course fitted with an “all or nothing” safety device. And interestingly for a minute repeater, the watch is rated to a water depth rating of 30m. This is quite exceptional for a minute repeater to have a depth rating as this would imply sealing the case which then prevents the sound from being emitted freely. And also unusual for an ultra thin case to feature a water resistant rating. The dial is quite interesting. The dial of the Octo Finnissimo Minute Repeater showing the pierced Arabic 12 and the bar hour markers. The movement can be seen through the openings. It is made of titanium, and the hour markers are pierced to show a peek into the movement. The Bulgari documentation does not say how the piercing is done, only that it is incised, cut-out, but we speculate that the piercings are made by a laser cutter. It is precise and clean. The openings serve to amplify the resonance inside the case to optimize the sound. The hands are a stylized Dauphine, with a crease in the middle to create a 3 dimensional look, and skeletonized. The movement is a Bulgari house manufactured movement, designed from ground up. The BLV C.362 is quite beautifully finished and can be viewed from the sapphire case back. The BLV 362 from the case back. The layout of the bridges are quite classical, and the finishing spectacular. The gongs are in steel, and the art of the minute repeater is in individually fashioning and finishing of the parts by hand. Each gong is adjusted by the master by hand and ear to ensure that the resultant notes and harmonics are what is deemed desirable. Minute repeaters cannot be mass produced. But each individually by a master watchmaker, taking his time to ensure that it is perfect. The hammers are also crafted with meticulous care. It is of critical importance that the hammers do not gather dust over time, so they are black polished. The centrifuge strike governor is just 3.3mm in diameter including the two inertia blocks, and as a measure to improve slim-ness, there is no cover for the governor. Design specifications on the finishing to be applied to each part of the movement. We inspected the watch, and find that all finishing aspects are done well. The anglage is well executed. As are the number of outward angles in the bridges. We don’t see any acute inward angles, though. Another beautifully executed aspect is the black polished hammers, which are truly a sight to behold. Marvelous. The hammers are black polished. Note the very sharp angles on the edges, as well as the anglage applied. Note also the open centrifugal strike governor at about 11:30 in the photograph. The jewels are clear, bright and beautiful hue. And in particular, we were happy to see that the jewel for the escape wheel is very large, and is attached via a black polished steel cap. This is the traditional method of attaching this jewel, and is very beautiful, but requires quite a lot of work to execute correctly. If we have a nit to pick, there is one. And this is really a matter of stylistic preference. We find the Côtes de Genève to be cut a bit to high, resulting in a very hard contrast of the lines. The swirls left by the machine used to make the côtes can also be seen. Although applied by hand using the machine, the côtes are made by rotating discs, probably diamond dust impregnated paper, and the angle for the cuts are very pronounced. We rather prefer a more subtle look of the hand applied côtes using pith wood. The balance wheel. Note the swirls left on the Cotes de Geneve, and the sharp deep slopes. We did not do our own audio recording, but present you Bulgari’s video showing the Minute Repeater and how it sounds. In case you might have thought that as the video is produced by Bulgari, the sound might have been enhanced. We are here to tell you that the sound in real life is exactly as in the video. Each strike is clean, clear, good intensity and volume. The attack of each note is precise and very fast, and the decay is nice an harmonious without too much hang. The cadence is just right, and very regular. We are very pleased with how it sounds. 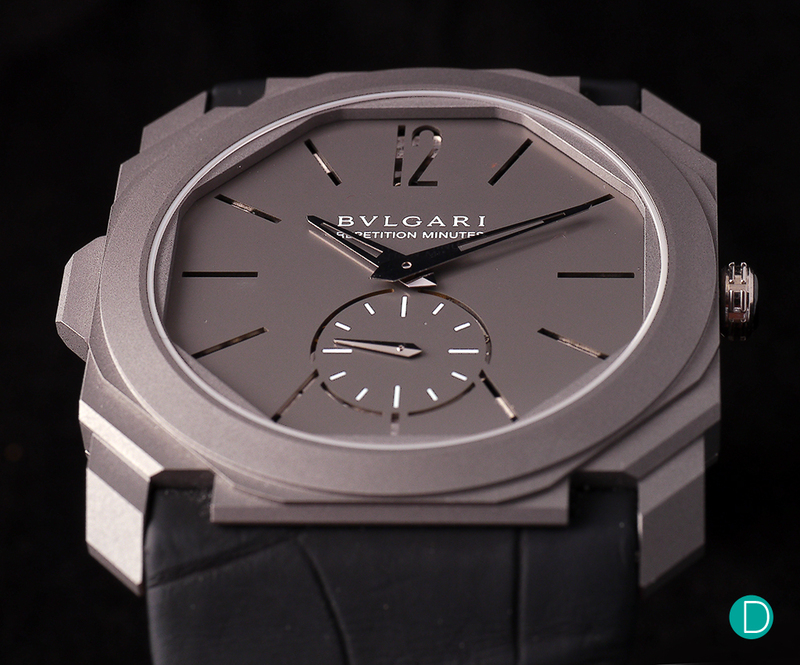 The Bulgari Finissimo Octo Répétition Minute retails for € 165,000 / CHF 160,000 before taxes, and is limited to 50 examples. None of the competitors make a minute repeater in titanium with a titanium dial. None have a water resistance rating of 50m. Most have no water resistance rating. Perhaps only Audemars Piguet offers one in a titanium case. The Royal Oak Concept Supersonnerie (US$497,000 approx €442,000 / CHF 492,000) is in a titanium case, but it is not thin in any sense of measure. The case is water resistant to 20m, and measures 16.5mm thick. Even the movement at 8.28mm thick is thicker than the case of the Octo Finnissimo Minute Repeater. Looking at the genre of ultra thin repeaters, we need to then consider those cased in precious metals. 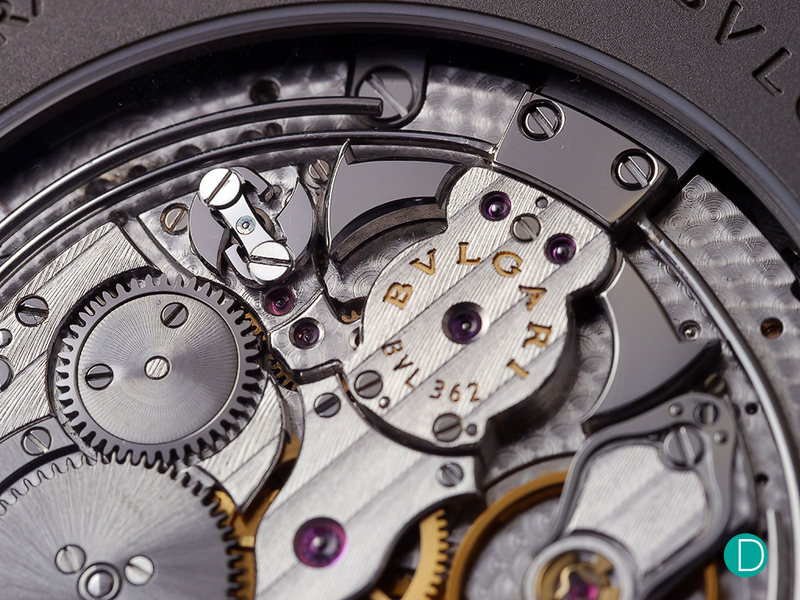 The critical numbers for the Bulgari is 3.12mm thick for the movement, and 6.85mm for the case. We begin with our favourite Vacheron Constantin Patrimony Ultra Flat Minute Repeater (S$663,400 incl GST in platinum, converting to € 399,200 / CHF 443,600). The VC C.1731 is thicker, measuring 3.9mm thick and when cased the Patrimony is a sliver under 8.1mm thick. The VC is more classical in design and perhaps offer more sober aesthetics. Sonically, we give the edge to the VC, as the tone structure is more beautiful (yes, this is sometimes subjective, as is when judging the sound of a Stradivarius, Guanari or Amati violin). But it is also more than double the price of the Bulgari. However, historically, perhaps VC has the cake with their C.4261 produced in the war years of 1941-42. Only 36 were ever made and the movement was only 3.1mm thick. beating the Bulgari C.362 by mere 0.02mm!! We have no information on the case dimensions of the 4261. Another interesting comparison might be the Jaeger LeCoultre Hybris Mechanica 11 (retail price of approximately € 380,000 in platinum) The JLC comes with automatic winding via an ingenious peripheral rotor, and a flying tourbillon. 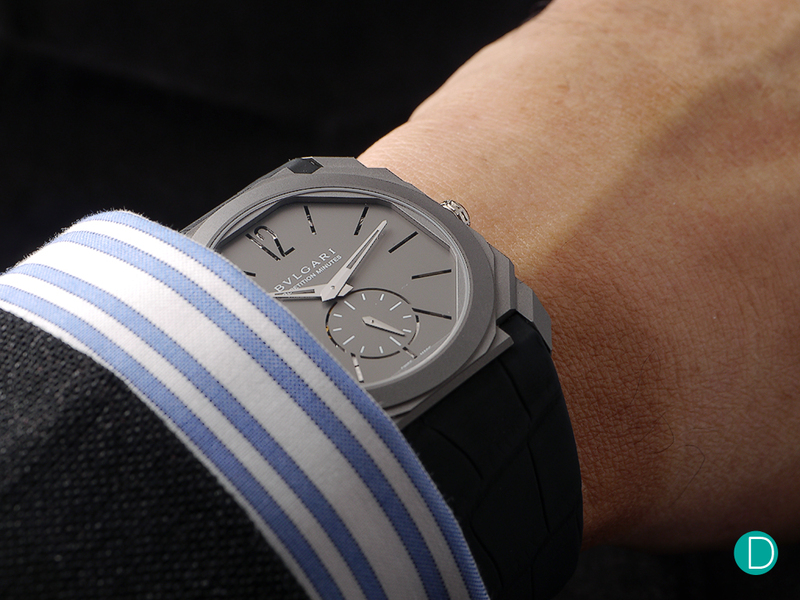 The JLC is a bit thicker, with the case at 7.9mm and the C.362 movement being 4.8mm high. Curiously, the Bulgari and the JLC has the same movement number, but pure coincidence. Another comparison might be to the F. P. Journe Repetition Souverain (we do not have current retail price, but one example was sold by Sotheby’s in 12 Nov 2013 in Geneva for CHF 365,000 Hammer price including Buyer’s Premium.) The Journe is in a stainless steel case measuring 4.64mm height, so the case thickness trumps the Bulgari. The movement is C.1408, and measures 4.0mm high. The Jorune uses a special execution to minimize height to achieve a super thin case, even though the movement is thicker than the BLV362. This is achieved by the placing the hammer in contact with the sapphire crystal, sliding over the glass as it strikes. Again we come to another watch which is rather unique. The big manufactures are getting very smart in their positioning, and ensuring that their products are unique or nearly unique (yes, we know there is no such thing as slightly unique, but are sure you understand what we mean). 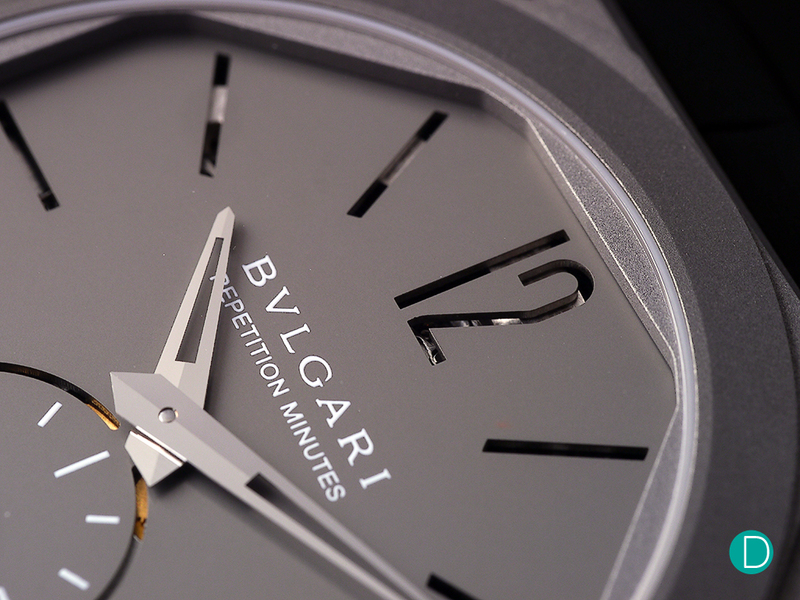 The Bulgari Finissimo Octo Répétition Minute is unique. No other manufacturer offers a ultra thin titanium cased minute repeater. No one else has a titanium dial (De Bethune offers titanium dials, but no repeater…yet). And none which can lay claim to being the World’s Thinnest Minute Repeater movement. Of course this title, like all records is only for now…another watch might come along to knock it off its perch, and its anybody’s guess as to when this might be. Bulgari Finissimo Octo Répétition Minute. Dare we say that this is an inexpensive watch? Perhaps not. But a fairly priced minute repeater? Yes! But focusing on the important issues on a repeater. Does it sound good? Check. Does it sound loud? Check…loud enough. Does it look cool? Check. Is it class leading in terms of price? Check. Is it the final word on minute repeaters? Probably not. 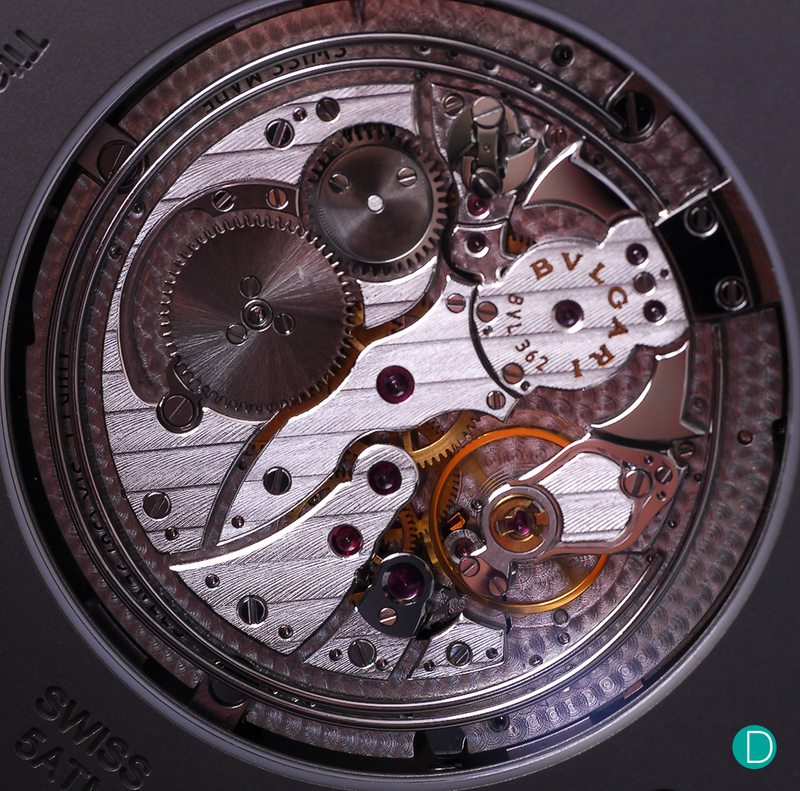 But although it is hard to say that € 165,000 / CHF 160,000 before taxes is inexpensive, in our books it is a fairly priced minute repeater. The competition, regardless of case material, or even case thickness, are all more expensive. 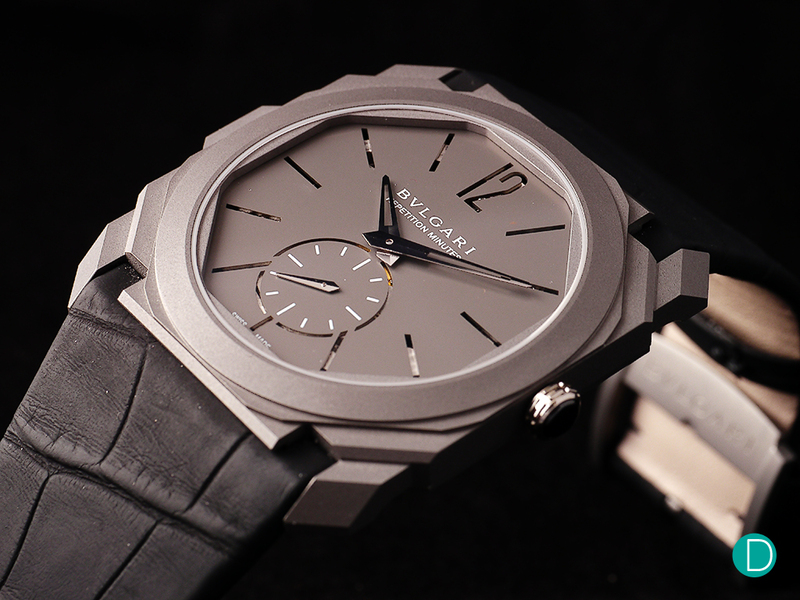 The Bulgari Finissimo Octo Répétition Minute remains one of the highlights of this year’s Baselworld. hours, minutes, small seconds, minute repeater. Titanium case, 40 mm x 6.85 mm, water resistance 30mm.